Swimming with dolphins has become a very popular activity lately, but there is some controversy around it. However, we share with you a few reasons why you should swim with dolphins if that’s what you want. Dolphins are very smart mammals, with amazing abilities and surprises while hanging out with them. Nevertheless, an encounter could be more special and educative than you expected. Discover why. There is nothing more joyful than being around marine species that you usually only see in books or movies. Swimming with dolphins is a great opportunity to see them up close and appreciate how intelligent they are. Besides, during all the interactions, an Animal Care Specialist will accompany you, which means that an expert will teach you everything you need to know about this experience! It has been proved that dolphins have always looked for the contact of human beings, either in fishers’ stories or antique sailors. Many antique cultures considered them as sacred creatures. In that way, being around us is nothing new for dolphins; they even look for it and enjoy it! Dolphins are 100-per-cent-social mammals: they bond with one another, name each other and communicate constantly. Being able to see that is really amazing. While swimming with dolphins, you can see how they play, recognize each other and communicate with you. For the duration of your experience, you’ll be one more member of the team, and trust us: you will never forget that. Where? When you look for a place to swim with dolphins, you should choose a natural habitat, since this is a more enjoyable experience, both for you and the dolphins. We suggest two of our favorites: Punta Cancun and Puerto Morelos. When? The whole year is ideal for this experience, especially in the Mexican Caribbean, where the weather is amazing every day. With who? You can go with friends, family, siblings, with your partner or by yourself. You can find options for everything! 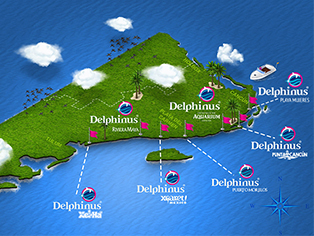 Are you ready to book your swim with dolphins in Cancun? Don’t think about it too much and take a step towards living an unforgettable experience right now!